Could a tax on plastics begin to change societies reliance on plastic? The UK governments budget for 2018 to 2019 aims to increase recycling and reduce use of plastics by introducing a tax on plastic packaging. Governments have great power to influence people’s behaviour. This power could be used to put an end to plastic pollution. Currently, 2.26 million tonnes of plastic packaging are used in the UK every year. By 2030 the World Wildlife Fund has estimated that this will increase by another one million tonnes. Clearly the trend for plastic use is going in the wrong direction. Most plastic items are produced from virgin (newly created) plastic rather than recycled material. This is because recycling plastic often costs more than just making new plastic. This is something that needs to change – surely making a product from scratch should not be cheaper than reusing old materials. So what is the UK government doing about this? Let’s have a look at these points in a bit more detail. By April 2022 a tax on plastic packaging with less than 30% recycled content will be introduced. This seems a long way away, but the industry and businesses will need time to alter their strategies and redesign their products. What will a tax do? The government hopes that the tax will encourage businesses use more recycled plastic in their packaging, increasing the demand for recycled plastic and boosting recycling rates. The idea is to make recycling more financially attractive and stop people using materials that can’t be, or are hard to, recycle. The government hasn’t yet worked out what the size of the tax will be, but the money made from the tax will be used to tackle the problems of single-use plastic and waste. This tax will just cover plastic packaging, so ignores other types of plastic products. £20 million has been pledged to the plastic pollution mission. £10 million will be put towards researching and developing new materials for packaging, different recycling processes and more efficient plastic waste management. The other £10 million will be used to increase recycling rates and reduce littering. One idea put forward is ‘smart bins’ that run on solar power and crush litter inside, so a bigger volume of rubbish can fit inside. As plastic has been made from oil and gas, when it is burnt it produces a lot of energy. This energy can be used to make electricity instead of from fossil fuels and also gets rid of the plastic waste. But this produces lots of greenhouse gases such as carbon dioxide and other nasty polluting gases, and the process isn’t currently that efficient. Many people wanted a tax to be put on waste incineration like the tax in place on waste going to landfill, to encourage the reduce, reuse, recycle strategy. But this hasn’t happened. The government did say they were considering it though – whether this will ever be put into action we don’t know. 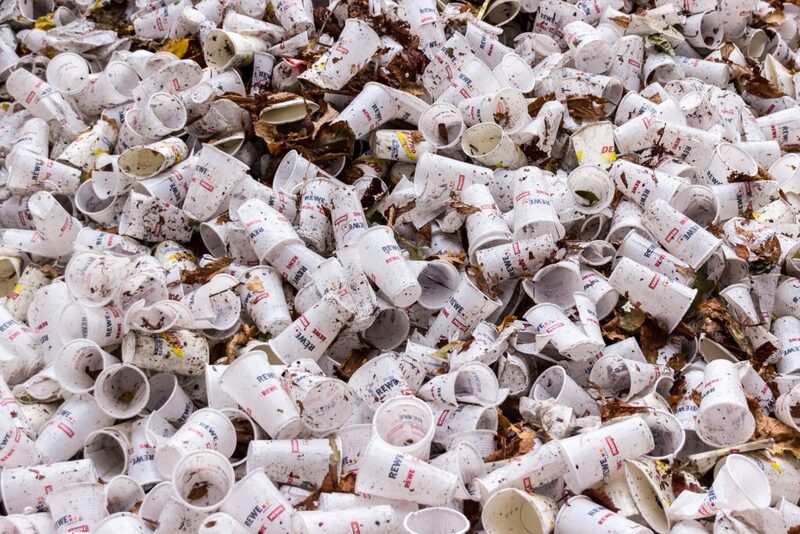 How many disposable coffee cups do you think are thrown away in the UK every year? The answer is over 2.5 billion! This is a huge amount. Even though take-away cups may appear to be made from paper, they have a hidden inner plastic coating which makes them difficult to recycle. In January 2018, MPs proposed an extra charge of 25p per disposable cup to make more people bring their own re-usable cups, or for companies to use compostable cups (this is being trialled in the Houses of Parliament). But when the Budget was announced, this eagerly anticipated levy was left out. What was the reasoning for this? In the past two years, the number of cups recycled has increased from 1 in 400 to 1 in 25. This is great progress, and a clear behavioural change. So the government thought adding an extra charge wasn’t needed. If progress doesn’t continue, they will reconsider the 25p charge. All this will promote and increase recycling action, hopefully improving the UK’s ability to recycle its own waste rather than sending it abroad. Whether this action is enough is yet to be seen. What steps would you like to see the UK government taking, and do you think they are doing enough?